MetroWest Opera comes to Boston with two operatic treats representing the humanity’s best and worst wedding behaviors. Old New Borrowed Blue pairs Argento’s Miss Havisham and contemporary work Bridegroom. The Argento proves that it’s possible to be a prolific composer and still not understanding the soprano voice. 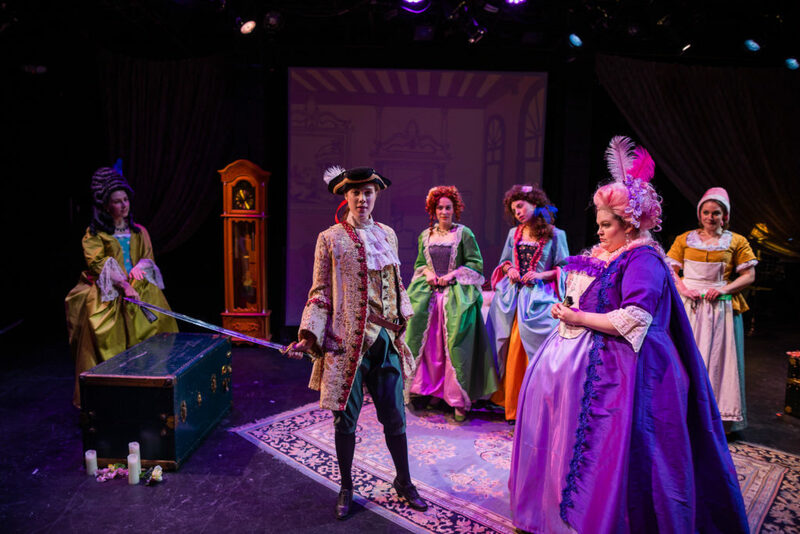 Shore’s one-act for women is a musical petit four for the senses. Celeste Godin is a committed Miss Havisham who leads us on an epic emotional journey. Havisham does not suffer her insanity lightly and proves that comprehensive mental healthcare is necessary at every age. Godin’s is a beautiful, powerful voice. Argento’s music complicates diction work by pairing high notes with Olon-Scrymgeour’s multisyllabic text. The text becomes a tongue-twister above the passagio (where no one wants them). Godin’s diction work is thorough and consistent, but we also misunderstood her because she had a tendency to darken vowels on held notes. Open vowels retreated into a covered sound and we lose the word. Technical preferences aside, Godin gives an exemplary performance of this difficult one-woman, infrequently performed opera. Living composer, Dan Shore’s The Beautiful Bridegroom is a charming, accidental lesbian romance in the style of commedia dell’arte… And the dramatic opposite of Miss Havisham. In it, a family (Brynne Pulver, Natalie Logan, Charlotte Jackson, Stephanie Hollenberg) hilariously vyes for the attentions of boy suitor, Captain von Frauenliebe (Elizabeth Kinder) who is actually the niece of matchmaker Madame Kirsten (Katherine Maysek) in disguise. To sum up, the women discover that they don’t need men. Except that they do. If the first act of Old New Borrowed Blue is the main course of the evening, then the second is dessert. Lovering’s direction and Shapiro’s conducting take on a flexibility unapparent in Havisham to reveal new depths in Bridegroom. The staging is lighthearted. The voices, when appropriate for the small room, are fresh and sweet. The acting is spot on comedy gold. (The “Charlie’s Angels” confession scene is particularly brilliant.) Wigs to trills, it’s everything one hopes from Figaro packed into 50 minutes. Christine Banna’s projection design grates in the first act but is wonderfully suited to the second. The audience needs all of its attention to focus on Godin as she maneuvers Argento’s music. It’s understood that Banna’s work is meant to inform the audience of plot points if they aren’t familiar with Great Expectations. Yet, the projections took us out of the drama. Her second act projections were more helpful, and put us further into the comedy. The transitions had fewer seams. It was the same level of artistry, but the implementation served Bridegroom better. Opera isn’t for everyone, but you won’t know if you don’t like it unless you attend and find out. Old New Borrowed Blue only runs for a few more performances. Opera fans won’t want to miss it. Old New Borrowed Blue is double cast. Performers will change depending upon which night one attends. 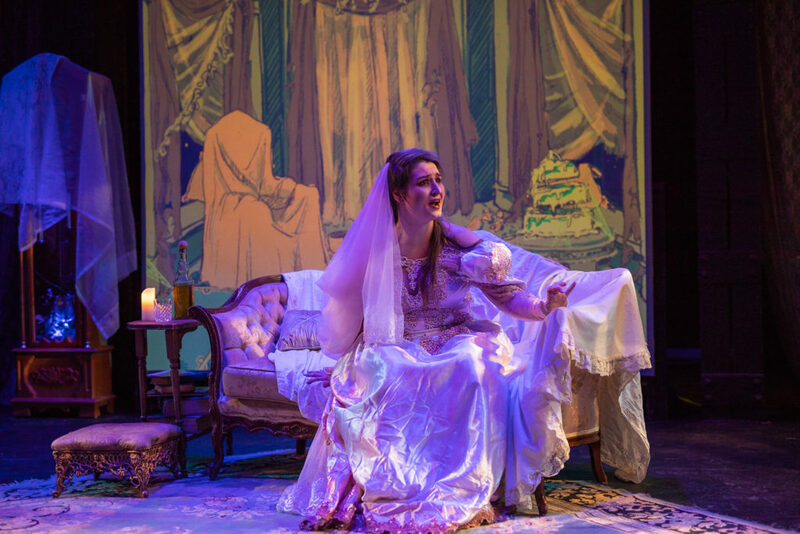 This entry was posted in Opera and tagged 2018, April, Boston, boston center for the arts, Brendon Shapiro, Cassandra Lovering, Christine Banna, Dan Shore, Dominick Argento, Elizabeth Kinder, Jon Olon-Scrymgeour, Kitty Drexel, MA, MetroWest Opera, Miss Havisham’s Wedding Night, Nile Scott Shots., The Beautiful Bridegroom by Kitty Drexel. Bookmark the permalink.